Why Your Heel Hurts | Podiatry Associates, P.C. Heel pain is, unfortunately, rather common, but it can be a big mistake to think this is “normal.” Instead, your heel pain indicates a problem that needs attention. The key to relieving the pain is identifying the problem so it can be properly addressed. When you come see us at Podiatry Associates, you receive compassionate medical care and attention from an experienced, highly-trained doctor. No matter which of our podiatrists are attending to your foot care needs, you can expect an accurate diagnosis and customized treatment plan to resolve the issue for you. Plantar fasciitis. If your heel pain is strongest following extended periods of rest—especially with the first steps of the day after a night’s sleep—and can be described as sharp or intense, you likely have acase of plantar fasciitis. This particular condition is the most common cause of adult heel pain. Achilles tendinitis. In some cases, the pain is located in the upper back part of the heel and is caused by an overworked Achilles tendon that has become inflamed. When the pain is strongest during or after physical activity—and then subsides with rest—it is likely you are suffering from Achilles tendinitis. Sever’s disease. When children, particularly adolescents, have complaints about heel pain, Sever’s is often the problem. Despite the name, this is not technically a disease. Rather, it is a condition caused by differences in growth rates of the heel bone (calcaneus) and Achilles tendon. Haglund’s deformity (“pump bump”). Excessive tight footwear can lead to an array of problems, including the development of Haglund’s deformity. In this condition, a noticeable bump appears on the back of the heel, and pain is experienced in the area where the Achilles attaches to the heel bone. Heel spur. Calcium deposits can build up over time to become a bone spur. When this happens on the bottom of the foot, especially when the plantar fascia begins to pull away from the heel bone, it is called a heel spur. This can sometimes accompany plantar fasciitis. Bursitis. The body has several small, fluid-filled sacs known as bursae used for cushioning. They are found in various areas, including the heel. When one of these sacs becomes inflamed, it is known as bursitis. This condition is a possible explanation for the heel pain you are experiencing. At Podiatry Associates, it doesn’t matter why your heel is hurting – we will diagnose the condition and then create a customized treatment plan to solve it for you. Our professionals are experienced, skilled, and consistently perform the same level of care they would administer to their own family. 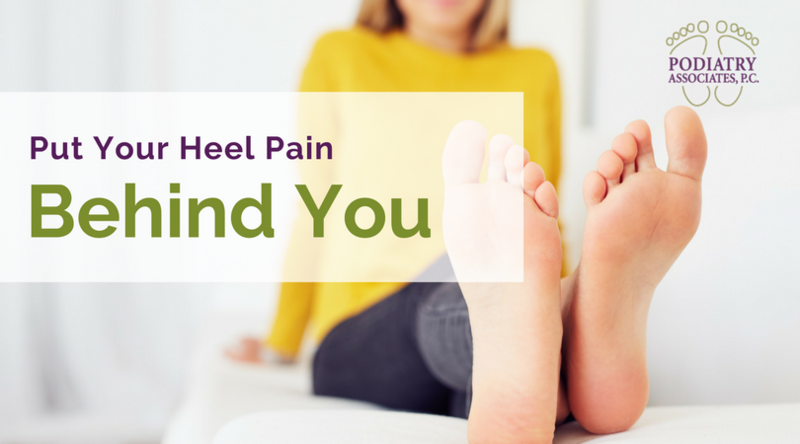 If you are ready to put your heel pain behind you, contact us by calling (303) 805-5156. One of our friendly staff members will be happy to provide answers to your questions and help you schedule an appointment for a time and office most convenient for you. Of course, you can also arrange your visit online by filling out the form found here on our website right now.